The following sets of flies cover most situations you are likely to encounter on U.K fresh and saltwater locations. You might not agree! Let me know if what you want is not here and I will sort a suitable set of flies out for you. 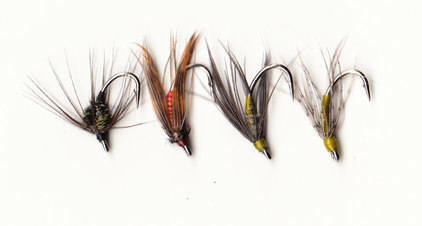 It is a pretty long list, if you prefer just click the following links to take you to the flies you are interested in. These are useful on still or running waters, the lead/copper wire underbody make these patterns cut through the surface film, great to cast at nymphing fish. The Pheasant Tail and Grey Goose are lighter than the Killer Bugs and Gold Ribbed Hares Ear. Pheasant Tail Nymph, Killer Bugs,Gold Ribbed Hares Ear, Grey Goose. 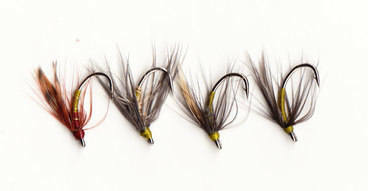 Top flies on any river or stream. Compliment the Yorkshire tyings perfectly. 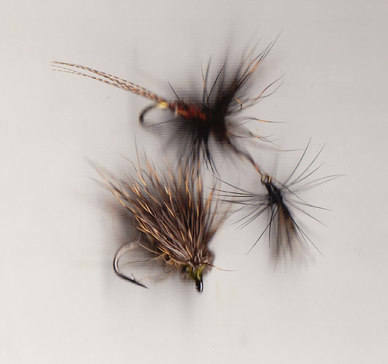 The clyde tyings imitate hatching and drowned duns while the Yorkshire Spiders mimic free swimming nymphs and pupa. 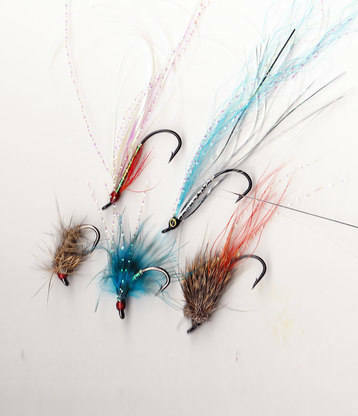 These tyings use coloured tinsels and wire ribs to create mini lures. Very handy in peat stained waters, good on the loch and well worth a cast as the light goes. Palmered and spider patterns included. These work on any fast flowing stream/river. Classic tyings that fish love. Dark Waterhen Bloa, Snipe & Purple, Partridge & Orange, Black Spider. Smaller lighter coloured patterns for the warmer months, compliments the above set. Waterhen Bloa, Partridge & Yellow, Black Magic, Brown Owl. 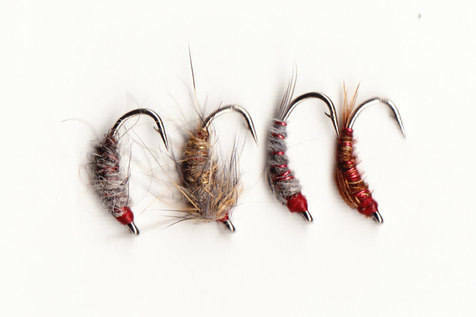 These are great to fish in teams of two and three Czech style or on the point with spiders on droppers. Try a point and dropper rig with 12" between point and dropper, these can be roll cast into pocket water a deadly method in fast water during the warmer months. Goldbead White Larva, Goldbead Hares Ear, Goldbead Killer Bug, Goldbead Stonefly. Smaller flies are often the key to success when larger tyings fail. 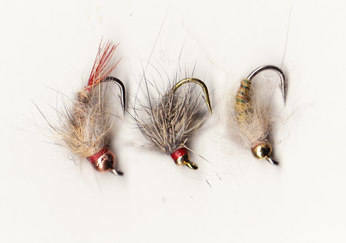 On a three fly Czech Nymph cast use one of these, the weight of the larger flies takes the smaller pattern down to where the fish are feeding. Goldbead Larva, Goldbead Hares Ear, Goldbead Peacock Bug, Goldbead Pheasant Tail. Two weights of fly in this set that are clearly identifiable in your flybox. Goldbead Hares Ear and Silverbead White Larva, both include lead wire as well as the bead. 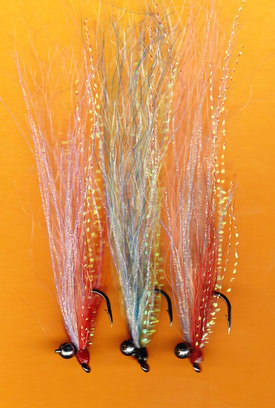 Tungsten Stonefly, tied with an orange tungsten bead and lead, a very heavy fly. This set includes standard leaded tyings and gold/silverbead(which also include lead wire) patterns that weigh just that bit more. 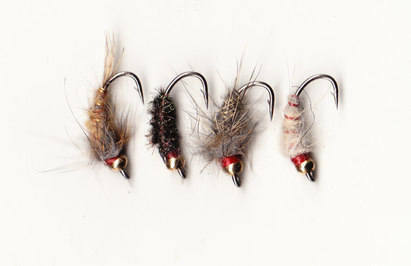 These are useful for trout and grayling on any water. An extra bit of colour will often do the trick when other patterns fail. Try in peat stained waters or as the light goes. 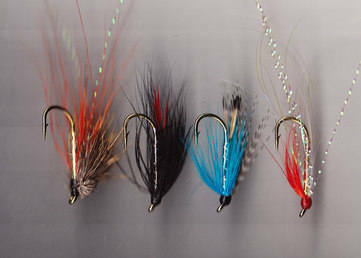 These three tyings in different sizes will cover most situations you will encounter on loch or river. Deer Spider - simple little caddis/stonefly imitation, spaly the deer fibres and it is a daddy! Long Legged Black Gnat - lots of little black things find their way onto the water this is the fly to try anywhere, anytime. 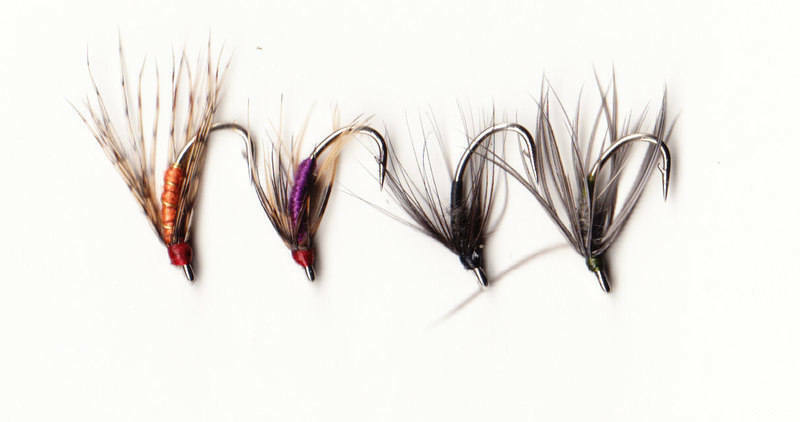 6 x #18 - even smaller, try these when larger flies fail. 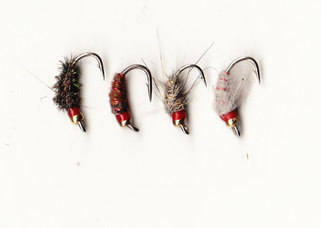 These are traditional tyings on large heavy wire wetfly hooks. Useful on loch or river in a variety of situations. 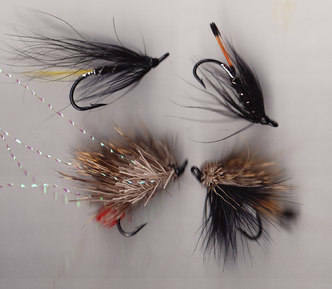 Try for sea trout in tidal rivers, also on the river as the light goes. Use on the point with wetflies on droppers in a big wave, the weight of the hook anchors the cast nicely. A few specials to try in salt or freshwater. Size Zero Orange Muddler HVY#8 - Brilliant surface lure, this tying skates in the film creating that deadly wake. 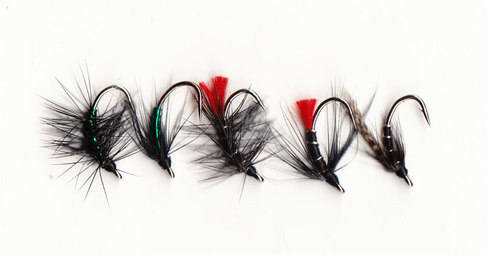 Hairwing Butcher HVY#8 - black, silver and red, classic colour combination. Teal, Blue & Silver - Classic tying that fish love. 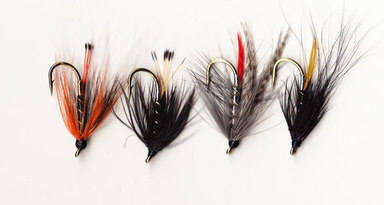 Buy these if you are heading toe the Highlands &Islands, great for salmon and sea trout in the salt or on loch and river. 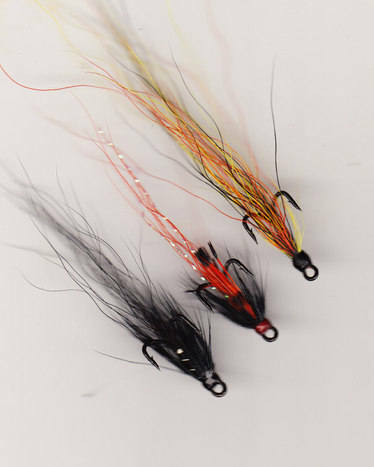 Make a 'Hebridean Cast' a two fly team with the Spiny Norman on the dropper in windy conditions, or the Muddler in lighter winds, these make the wake that bring the fish up that take the bob or point fly. Whether you are casting at sea trout or mackerel fishing tidal esturies and saltwater lochs can provide some super sport through the summer. Fish feed on whitebait, elvers , sandeels and all manner of shrimps and louse type creatures, the following selection covers most situations. 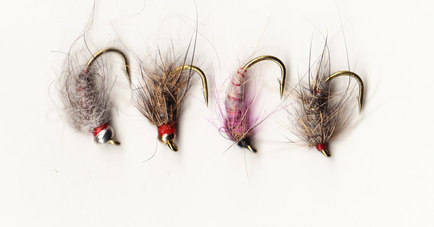 These flies are tied on carp hooks and will land anything that swims in U.K waters. Click here to read an article on rock fishing. When the larger doubles and tubes fail try these.